Sister Janice Miriam Bahl, O.S.F. Sister Janice Miriam Bahl, O.S.F. 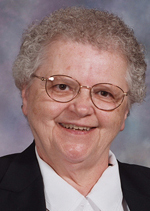 (formerly Sister John Andrew), died Oct. 7 in Assisi House, Aston, at age 78. She had been a professed member of the Sisters of St. Francis of Philadelphia for 50 years. Sister Janice was born in Allentown, Pa. She was a member of St. Mary Parish in Catasauqua and graduated from Catasauqua High School. She entered the congregation in 1962 and professed her first vows in 1965. Sister Janice earned a B.A. in social sciences from Neumann University and an M.A. in religious studies from St. Charles Borromeo Seminary. She served primarily in education and parish ministry. Sister Janice ministered for 48 years in the Archdiocese of Philadelphia. She taught at St. Mary of the Assumption School in Manayunk, St. Mary School in Schwenksville, St. Benedict School in Philadelphia, Resurrection School in Chester, St. John Neumann School in Bryn Mawr, and St. Stanislaus School in Lansdale. During her years in parish ministry, she served as director of religious education at St. Stanislaus Parish and at St. Paul Parish in Norristown and St. Anastasia Parish in Newtown Square. During her later years in education and parish ministry, Sister Janice also served as a consultant for Silver Burdett/Ginn Publishing Company. From 2003 to 2008 she served as record manager for the Sisters of St. Francis and for a short period also worked with the Religious Education Institute at Neumann University. From 2008 until this year she lived at Our Lady of Angels Convent in Aston and served in local house ministry. Earlier this year she moved to Assisi House and served in prayer ministry until her death. Sister Janice also minister for three years in the Diocese of Allentown where she served in parish ministry at St. Andrew Parish in Catasauqua. All services will be held in Assisi House, 600 Red Hill Road in Aston, on Wednesday, Oct. 14. A Christian Wake Service will be held at 9:30 a.m. followed by the viewing. Mass of Christian Burial will be at 11 a.m. Burial will be in Our Lady of Angels Cemetery in Aston. Sister Janice is survived by her cousins and by her Franciscan family.